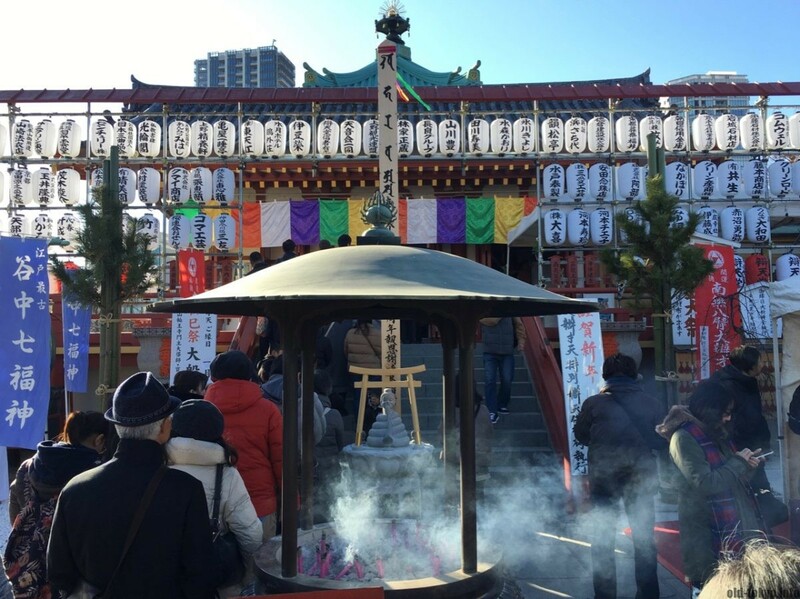 Praying at a shrine or temple at the start of the year is a strongly engrained custom in Japan. 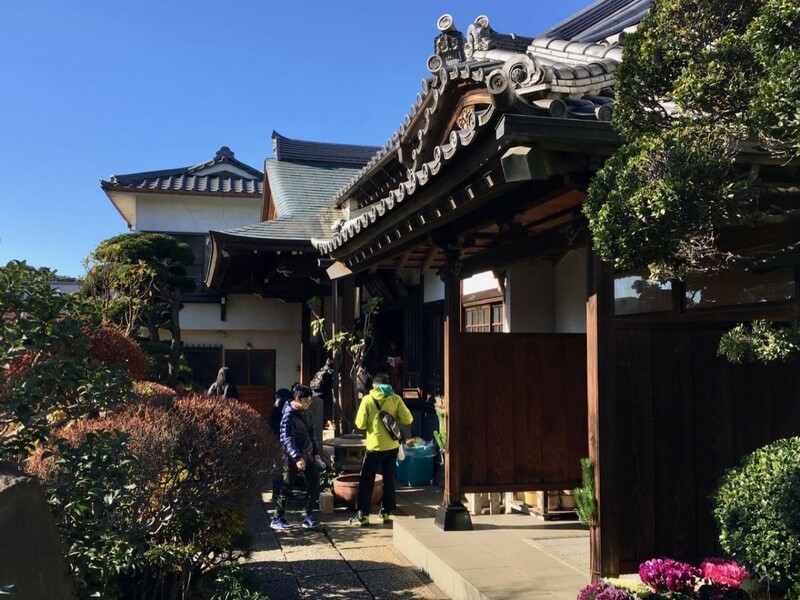 Next to hatsumōde (the first visit of the year to shrine/temple), many people visit 7 shrines/temples to ask support to the so-called 7 lucky gods. This is called the shichifukujin-meguri or 7 lucky gods pilgrimage. I have been doing such a pilgrimage for the last couple of years: Yamanote in Meguro, Mukōjima (along the Sumidagawa river) and Ningyōchō. 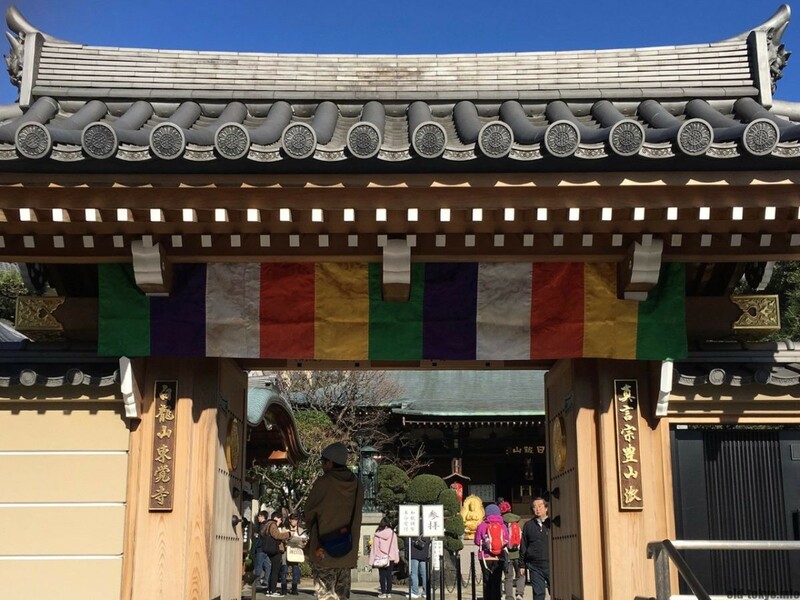 Following the alleged oldest trail in Tokyo last year in Meguro, I did another one that is touted as being the oldest as well, right in my beloved Yanaka (be sure to check my Yanaka Temple Walk if you are interested in temples). 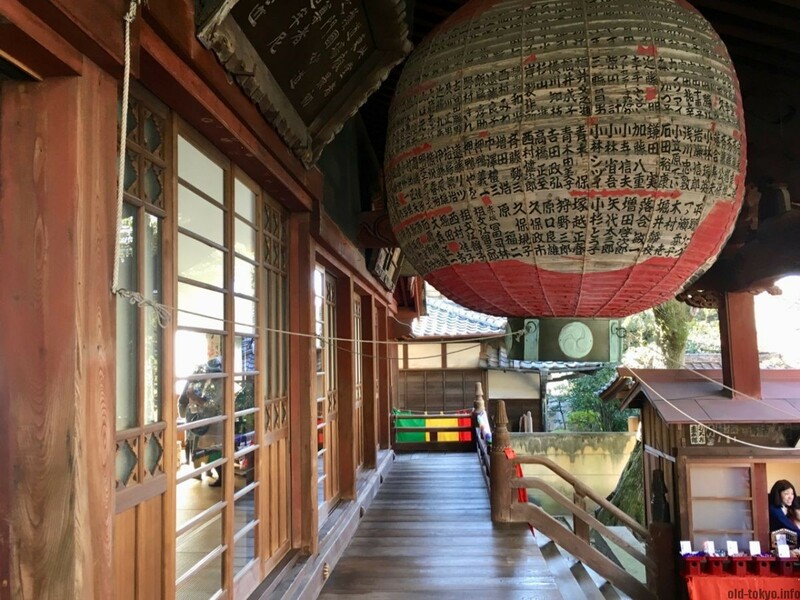 In the pamphlet they provide with the Yanaka trail (also in English), they assert that Yanaka is the oldest 7 lucky gods pilgrimage and that the custom of visiting these 7 lucky gods even originated here in Yanaka. 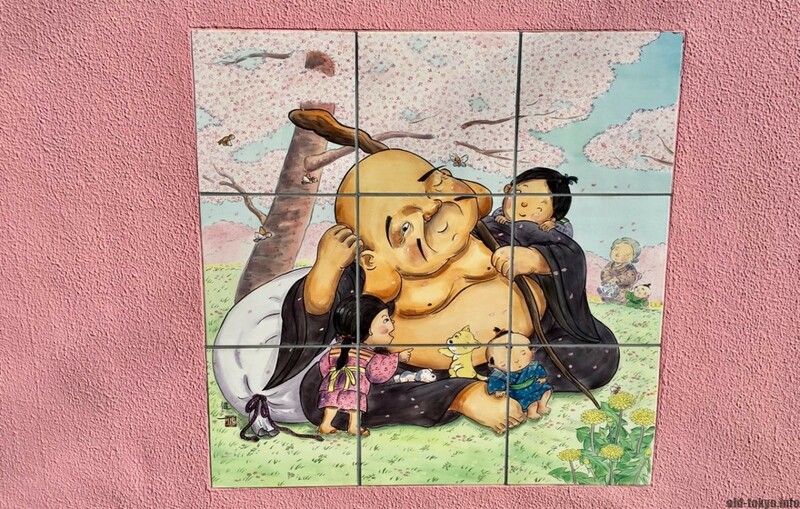 These 7 lucky gods are particularly popular all over the Shitamachi areas, where you can find them being honoured at a large number of shinto shrines and buddhist temples. 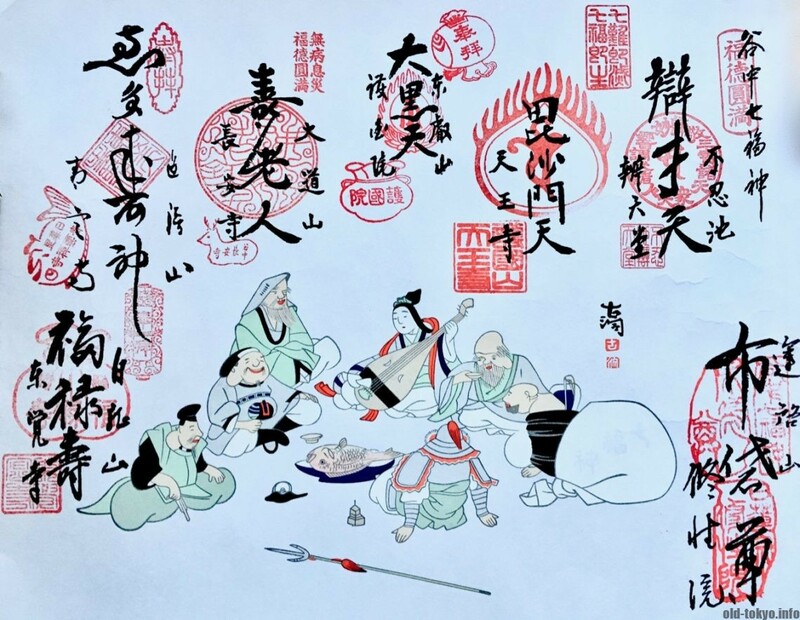 As these 7 gods became associated with certain professions and arts, they are seen as being closer to the common people as compared to other deities. All but one (the lucky god called “Ebisu”) originate from China and India. 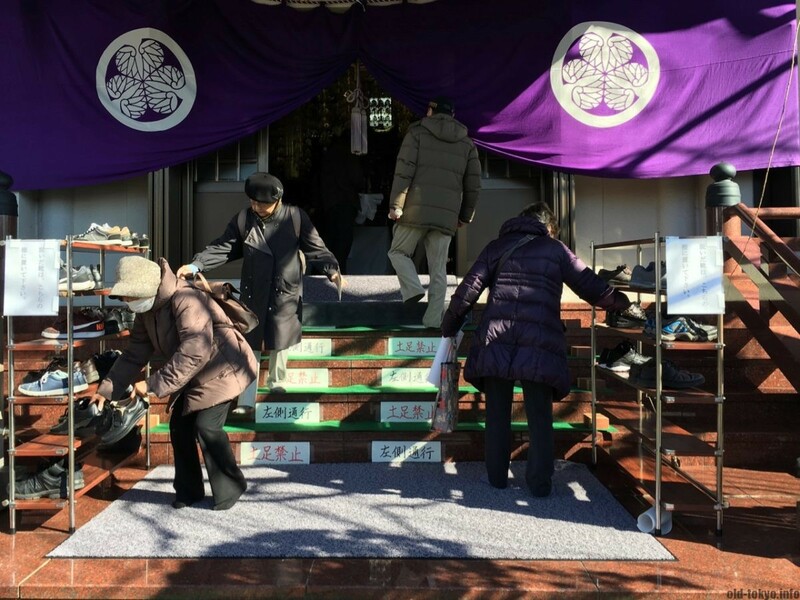 During these pilgrimages, you buy a board or paper (called shikishi) from the first temple/shrine you visit and then receive a stamp and/or signature from each shrine/temple you visit, so it is kind of a stamp rally. 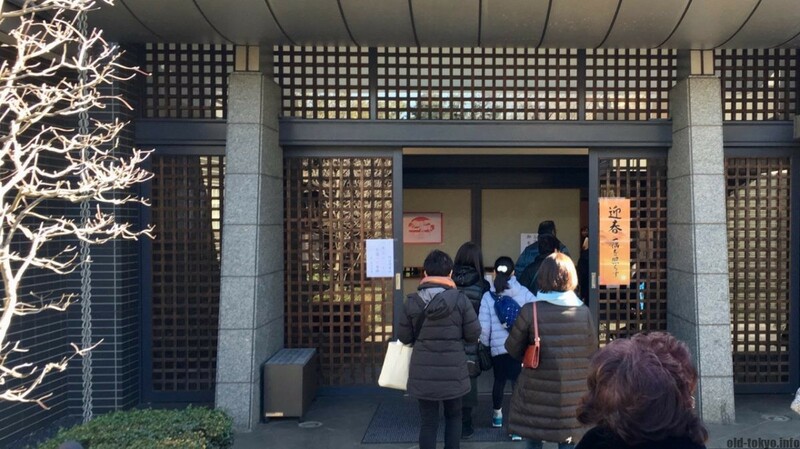 Please note you can only do them in the beginning of the year, the Yanaka one you can do between 1 and 10 January. For each of the pilgrimages I have been doing so far, the procedure to get the stamp/signature was a little different. In case of this Yanaka course, the signatures (calligraphy) were already made on the paper I bought at the first temple, and only the stamps were added on the paper by the monks at each temple. Each stamp was JPY 200, and the paper JPY 1000 (I paid JPY 1200 at the first temple, paper plus the first stamp). While at all previous pilgrimages I did there was a sturdy “board” on which to put the stamps, for the Yanaka course they opted to use Japanese paper (washi). Very nice, but more difficult to manage. 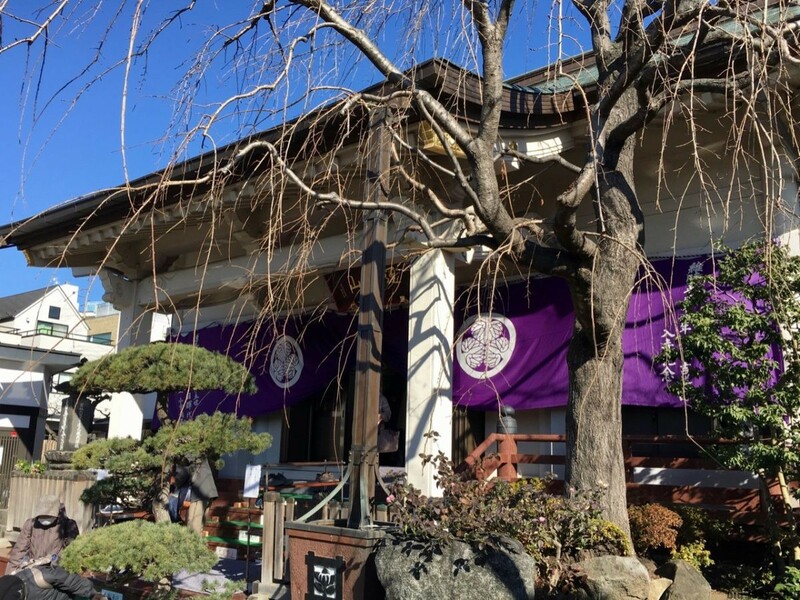 Easiest to start at Tōgakuji Temple, a 6 minutes walk from Tabata Station (JR Yamanote Line), and then go south. But you can start at any temple you like and temples do not need to be visited in order. Walking along the temples with a short visit takes about 2 hours. Collecting the stamps is only possible between 1 and 10 January 9:00-17:00. It is safe to allocate at least 3 hours in order to do the full pilgrimage, it took me 4 hours including a coffee break and lunch. Entrance of each temple is free. From start to finish is around 5 km. You can find a map with the 7 temples/shrines I visited at the bottom of this article. Bring many 100 yen coins, they can break a 1000 yen note if necessary but it is more kind to the people working at the temple to pay with 2 100 yen coins. Wear shoes that you can easily take off, in some temples you need to go inside without your shoes . Temple of the Shingen sect of Buddhism founded in 1491, originally established in Kanda, but moved to Tabata around 1600. It’s a fairly generic temple, were it not for the Niō statues from 1641. These wrathful and muscular guardians of the Buddha that are standing today at the entrance of many Buddhist temples are covered in red papers so that you can’t see the statues at all. The custom is to hang red papers (akagame) on the statues on a place where it hurst on your body (not just on one, but on both the statues, on the same spot) and the gods will then miraculously cure you. When you have been cured of your ailment, you can repay the gods by offering stray sandals to the temple. 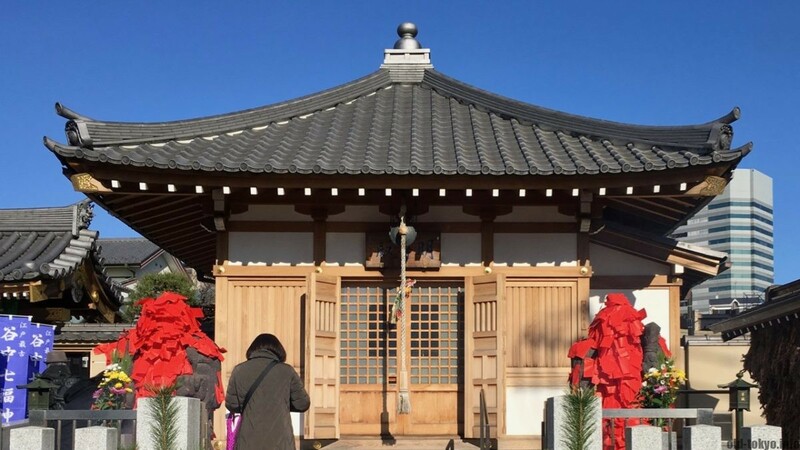 As this temple is often used as a starting point for the 7 lucky gods pilgrimage, they further developed this temple into a true 7 lucky gods power spot. 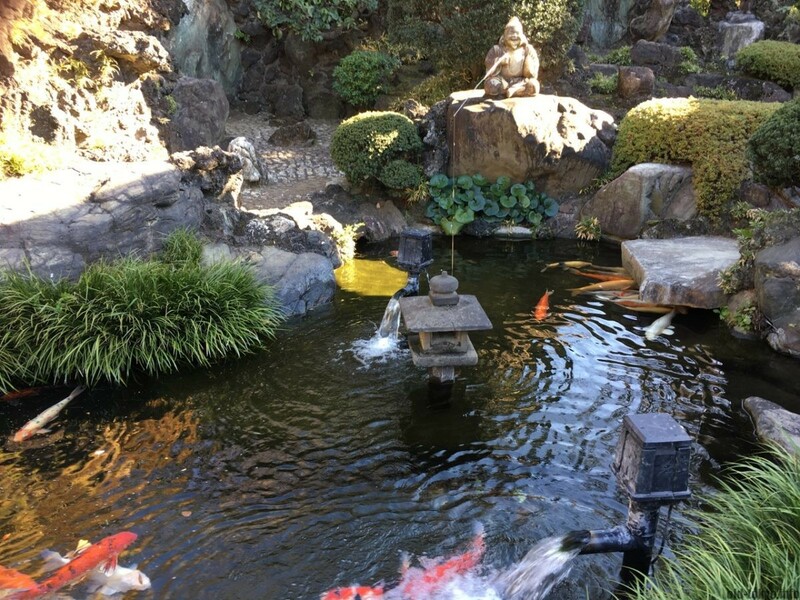 There is a statue of each of the lucky gods in their small Japanese garden behind the temple. You can go there by taking the small pathway on the right hand side of the temple and then enter the garden through the small door. The garden is often closed for visitors, but open every day during the 10 days of the 7 lucky gods pilgrimage at the start of the year. This Ringai school Buddhist temple was established in the mid-18th century. The building is rather beautiful, but the parking garage in front kind of cancels out any sense of beauty you might feel for the place. A stone monument with writing from Takizawa Bakin (1767-1848) is famous at this temple. He is known for writing “The Eight Dog Chronicles” (Nansō Satomi Hakkenden), a Japanese epic novel in 106 volumes about eight samurai half-brothers, all of them descended from a dog and bearing the word “dog” in their surnames. Shushōin was established in Nerima-ku in 1573, but this Nichiren Buddhist temple was moved to its current location in 1663. Together with Seiunji it is called one of the temples for hanami (cherry blossom viewing). I guess I will have to come back in spring. The lucky god Hoteison that is worshipped here sure plays a big role in the affairs of this temple. The temple is surrounded by a pink wall with on it cute depictions of Hoteison. The temple itself is very small, but beautiful. It is the first temple on the route where I had to take off my shoes and could enter the temple itself. Lucky god: Hotei (or Hoteison), a Chinese Zen priest, is worshipped here as a god of fortune and guardian of children. He is also called the god of popularity. In this course he is most closely associated with abundance. 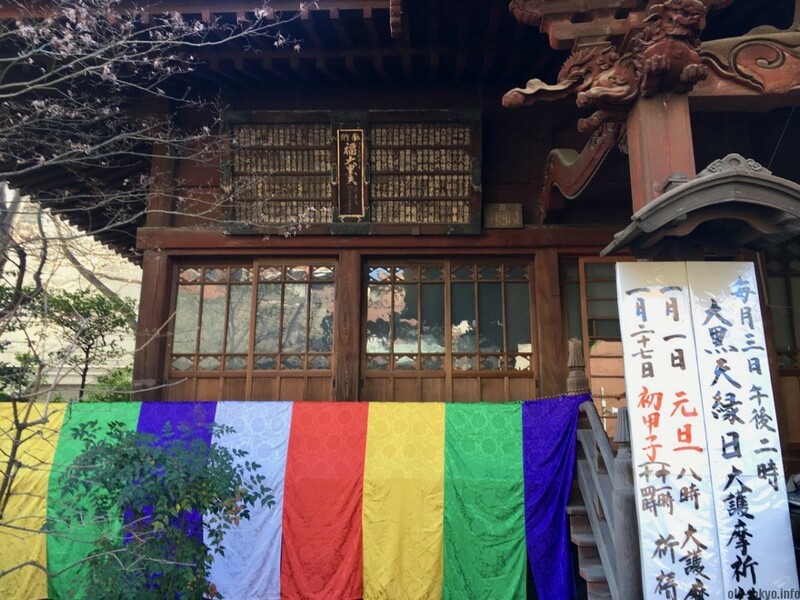 Established in 1274, it is the oldest temple in Yanaka. 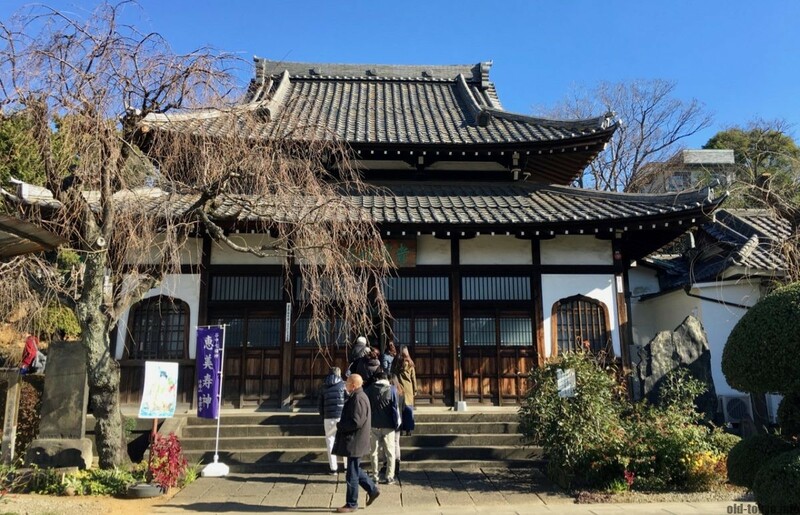 Even though it was initially a Nichiren temple, at the end of the 17th century it was forced to convert to Tendai, as their particular type of Nichiren was deemed “anti-regime”. Tennōji used to be a major temple in this area as evidenced by the huge cemetery (Yanaka Reien) next door that was part of this temple, but when the cemetery was nationalized in 1873, Tennōji also lost some of its glory. Its temple grounds used to be 10 times the size of what it is now. Tennōji was one of three temples in the Edo period (1603-1868) that was authorized to hold lotteries, making it an extremely popular temple. However, these lotteries were eventually banned in the 19th century. These days, the beautifully maintained garden, with bronze buddha statue (cast in 1690) is the main thing to watch for. The place to collect the lucky god stamp was a bit harder to locate as compared to the previous temples. After you go inside you need to follow to the right and enter the building at the end of the pathway. The second Rinzai school Buddhist temple on the route. This one was established early 18th century and is the smallest of all temples on this 7 lucky god pilgrimage. There is only a narrow path after passing through the gate. I also entered the temple building to receive the stamp, feels all very cozy. Lucky god: Juro-jin is the lucky god at this temple. Virtue and longevity is what he provides. 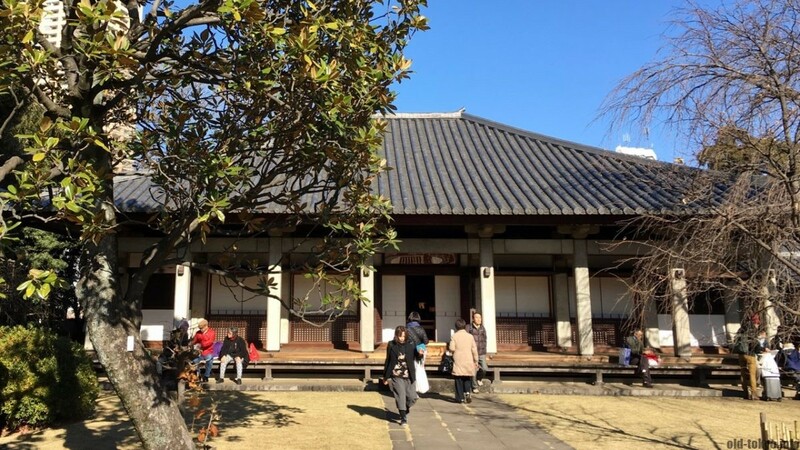 On the side of Ueno park, Gokokuin is a subtemple of the once glorious Kan’eiji. Established in 1630 as a Tendai sect Buddhist temple, it was moved to its current location in 1709 and rebuilt in 1722. The living quarters of the temple (1st floor) were rebuilt in 1927. This temple is a true hidden gem. I was taken aback by its beauty: the temple building, the Noh theater, the garden and in particular the giant lantern hanging from the main sanctuary. As a bonus, the stamp is given inside the temple building, a very large traditional tatami area where you can freely roam around. Our final destination, Benten-dō (full name: Shinobazu-ike Benten-dō), is right in the middle of the Shinobazu lake in Ueno park. This temple is modeled after Hōgon-ji Temple floating in the middle of Lake Biwa, the largest lake in Japan. In terms of the lucky god story, this temple with hexagonal tower is the most dedicated of them all. The name Benten-dō derives from Benzai-ten, often depicted with a biwa, a traditional Japanese lute. You can see this lute in stone right in front of the building (left side). Not just pray in front of the main sanctuary, but also enter the temple buildings which is otherwise not possible. At Shushōin Temple, Tennōji Temple, Chōanji Temple and Gokokuin Temple. Note: I have added “temple” to the temple name in Japanese for clarity. The “-ji” suffix in Japanese means “temple”.